Mercedes-Benz used its stunning facility of Mercedes-Benz Brookands as the venue for the World launch of its updated A-Class for 2016. The new A-Class ranges from the 81mpg, 89g/km A180BEE to the 381PS, 475Nm torque A45 AMG 4-Matic. Performance extends from 0-60mph in 11.0 seconds to 0-60 in just 3.9 seconds, which retains the title of the A45 AMG 4-Matic as the fastest 2.0 litre hatchback in the World. But besides improvements in performance, fuel economy and CO2 emissions, the new A-Class offers better ride comfort, better seating and better crash protection with a range of electronic measures that must reduce any chance of what used to be called an 'accident'. 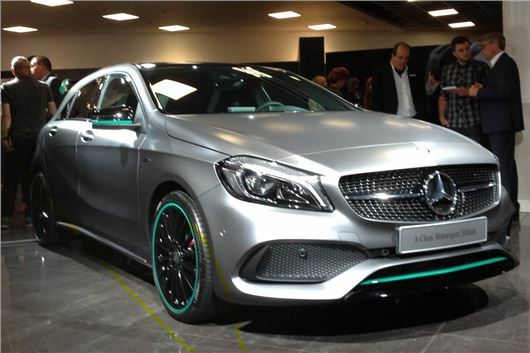 The new Mercedes-Benz A-Class can be ordered in the UK from 3rd July 2015, with first deliveries from September 2015.